Millions of people have visited the famous natural wonders and national parks of southern Utah and northern Arizona: Grand Canyon, Bryce Canyon, Zion, Canyonlands and Arches. World-renowned landscape and wildlife photographers have captured the magnificent views, amazing light and timeless beauty of these long-protected places. Until recently, however, a little known area of southern Utah, near the town of Boulder, has seen fewer visitors. For serious photographers looking for a new palette, it is an image-rich and seldom photographed landscape and environment. It was during 1996 that the Bureau of Land Management designated 1.7 million acres of this desert area, and its incredible combination of plateaus, sandstone canyons, rock formations and cliffs, as the Grand Staircase-Escalante National Monument. The Grand Staircase-Escalante area shares an eastern border with Bryce Canyon National Park and a western border with Capitol Reef National Park and the Glen Canyon National Recreation Area. Dixie National Forest is to the north and the Arizona State line is the southern border. Access to the northern expanse of the Monument is via Scenic Byway 12. From this route, you can connect with backways and trails to the area’s most spectacular natural features. The Grand Staircase-Escalante National Monument is named for the intricate labyrinth of rocky canyons, cliffs and plateaus that appear like giant steps from the northern end of the Grand Canyon. Escalante was an early Spanish explorer of the region, now memorialized in the name of the Escalante River, which is the natural drainage system through the canyons of the area. Here, you can photograph grand, sweeping vistas as well as the details of the living desert of plants and animals. A specific section of the Grand Staircase deserves to be photographically recorded. 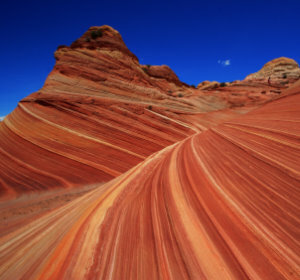 “The Blues” are a grouping of bluish rocks, unique to the Grand Staircase, considering most it is a spectrum of pink and red rocks. If you keep a sharp eye, then some of the details you may discover are dinosaur fossils. According to the many paleontologists that have dug in the Monument, it may be one of the best sources of dinosaur remains in the world. Wonderful cultural treasures that have been preserved in the Grand Staircase-Escalante area are the ancient sites where the Anasazi and Fremont Indians lived for centuries. One of the largest Ancestral Puebloan communities west of the Colorado River, known as the Coombs Site, is believed to have been occupied from AD 1160 to 1235, and may have housed as many as 200 people. The Anasazi and Fremont people also left records of your cultures in pictographs and petroglyphs to be found and photographed on cave walls throughout the Monument. Smokey Mountain Road is one of the back roads accessible from Scenic Byway 12 that will lead you to views of Navajo Mountain, a sacred site for this Native American culture. Travel Hole-in-the-Rock Road to reach Devils Garden, one of the “secret” desert treasures, with a dazzling display of rock formations and intricate shapes carved by wind and weather. Take the Cottonwood Canyon Road Scenic Backway to Grosvenor Arch. This 60-foot tall natural structure is a double arch with a smaller hole next to a larger opening. Find the right position, when the light is just right, and you might be able to capture reflections from the translucent selenite crystals scattered in the area of the arch. Take your camera to Calf Creek Recreation Area for serene images of its 126-foot waterfall and naturally shaped grotto of stone. You’ll be equally compelled to dive into the sheltered creeks and swimming holes. Follow trails along the Escalante River, which will provide access to various side canyons with new photographic challenges. Coyote Gulch is where you’ll find Jacob Hamblin Arch, while Egypt Canyon is a physical challenge. A bit of tough climbing will bring you to natural scenes for your camera that you simply can’t find anywhere else in the region. Make your photographic trek into the Grand Staircase-Escalante National Monument region one you will never forget, when you join the exclusive Visionary Wild Boulder, Utah Workshop, October 15–19, 2012. You’ll be guided through an intensive and advanced training seminar hosted by Jack Dykinga, one of the world’s most respected landscape photographers, and Justin Black, renowned photographer and Visionary Wild workshop leader. Visionary Wild workshops are popular and the limited spaces fill quickly. For more information, visit http://visionarywild.com/workshops/boulder-utah/.